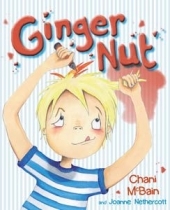 Calum McGregor is a blond boy in a ginger family. His mum and dad have red hair, his big sister and brother have red hair, his grandpa had red hair before he went bald, and he even has a cat called Ginger. Calum is fed up with being the odd one out, so he takes matters into his own hands and decides to make his hair ginger. He tries eating carrots, drinking Irn-Bru, and colouring his hair with felt tips. He even puts his poor cat on his head! But all his hair-brained plans fail. Is Calum destined to always be the odd one out? Or will he learn that theres more to life than being ginger?A sweet and very funny picture book, with a refreshingly positive attitude towards being ginger.